What scriptural topic do you think evokes the most confusion and controversy among those professing to be followers of Yahweh? If your answer is the Festival of Passover it is obvious that you are quite astute. It seems that almost everyone who attempts to correctly observe the Festival of Passover is at variance with some other person or group. Logic dictates that not everyone is right and at the same time there is the possibility that everyone is wrong. What’s the problem and how does it get fixed? Well, so much for abiding by the scriptural precept. There is no lack of written material by numerous Sacred Name groups purporting to prove the correct method of observing the Festival of Passover. Needless to say, one would be hard pressed to find a universal agreement on the issue and when the dust settles over the various arguments touted back and forth, most everyone realizes the little progress that was made if any to find truth and unity. Basically the arguments presented by the various groups for the correct observance of Passover are fairly well known so I won’t bore you with the details by repeating the numerous and sometimes conflicting viewpoints. What we would like to do is introduce a perspective that might help break through the barriers and allow for Yahweh’s truth to prevail in regard to the Passover dilemma. First of all we would recommend an action that most people are hesitant to do which requires humility. For instance, one has to come to the realization that the interpretation of Scriptures does not come from a person’s inner self. Therefore you need to admit that the interpretation of Scriptures or scriptural truth does not come from you. If you can get past that, you can begin to seriously tackle the situation. Next, let’s keep it simple. For instance, we are only going to address one aspect of the Passover controversy and hopefully provide some food for thought in order to get those brain juices going, provoke some questions, and make some progress in the right direction toward Yahweh’s truth of the matter. Question: Does the Festival of Passover and Unleavened Bread begin on Abib 14 and end on Abib 20 for a total of 7 days of the Festival? This would also indicate that the first day of Unleavened Bread begins on Abib 14. Most professing followers of Yahweh would disagree. Sure I know, there’s all that proof in the scriptures that proves otherwise. You’ve heard the arguments. Been there, done that. Confusionville! For the sake of simplicity, let’s try using Yahushua the messiah as the benchmark, so to speak, to provide us with a good example of the Passover observance. I mean, if anyone was going to be right about the Passover, surely it would be Yahushua. No argument there I hope unless of course you disagree with Scriptures! No doubt, the implications gleaned from these two verses pose a huge problem for many! According to the scriptural narrative, Yahushua had made preparations for Passover prior to Abib 14 and he along with his disciples ate the Passover meal that night after sundown at the beginning of Abib 14. This would mean that Yahushua observed the Festival of Passover including the eating of the Passover lamb, was murdered, and was buried on the Jewish day of preparation of the Passover (Abib 14)! Also, unless there is information to the contrary, Yahushua and his disciples would have eaten unleavened bread with the Passover meal after sundown at the beginning of Abib 14. 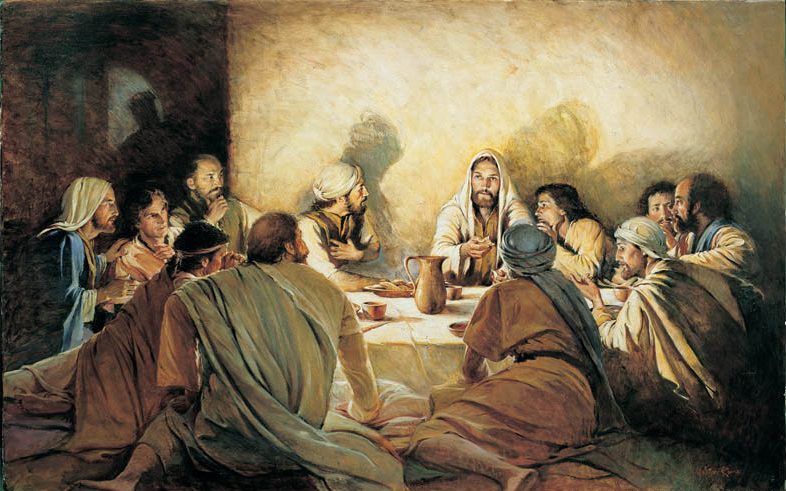 One of the counter arguments is that the meal that Yahushua ate with his disciples at the beginning of Abib 14 was not actually the Passover meal. According to the following passage, just what then was going on? One conclusion could be that Yahushua knew he was to eat a fake Passover meal and then to perpetrate the fraud he lied to Peter and John. Of course he would have had to lie, as he knew the true Passover meal was to take place at the beginning of Abib 15. Continuing with the thought, since Yahushua knew he couldn’t observe the Passover meal on Abib 15 (he knew he would be dead by then) he just bumped the meal up by a day. Besides he also had to be the sacrificial lamb that was slaughtered in the afternoon of Abib 14 just as the Pharisaical religious leaders were killing their Passover lambs which were to be eaten after sundown at the beginning of Abib 15. You know how it goes, sometimes you got to break the law to keep the law. Of course, if you want, this scenario could be spun in all kinds of directions. You get the drift. On the other hand, the Jews (Pharisaic religious leaders and followers) killed their Passover lambs during the afternoon of Abib 14 in preparation for their Passover meal after sundown, beginning Abib 15. By now, I hope you’ve seen the red flag hoisted. Who do you think observed Passover correctly? Yahushua or the Pharisaic Jews? We’ve barely scratched the surface here but this should at least, in a very simple way, demonstrate why the pertinent questions need to be asked of those who have placed themselves as leaders and teachers of Yahweh’s assemblies. Also, it is incumbent that the teachers who purport to uphold Yahweh’s truth make an honest attempt to provide the best scripturally correct answers to these questions. One individual who has questioned the Passover and Unleavened Bread subject, whose name is Dennis Bitterman, several years ago had sent an open letter to all the assemblies and teachers challenging the generally accepted 8-day observance of Abib 14-21 for Passover and Unleavened Bread. Dennis has done a fairly good job of briefly presenting the evidence supporting a 7-day Festival of Passover and Unleavened Bread observance which consists of Abib 14-20. This letter has been converted into a PDF file and made available for everyone to evaluate and determine if there is any merit to the conclusions of Dennis. Just click on the following link to download: EAOY Open Letter. For those with slower internet speeds please be patient as the file size is about 4 mb. Note: As of this date, there does not seem to exist any written response to Dennis’ letter by any elder or teacher from the various Sacred Name groups. This entry was posted on 02/24/2012, 1:51 pm and is filed under Calendar, Easter, Feast Days, High Sabbaths, Holy Days, Passover, Religion, Vernal Equinox, Yahweh. You can follow any responses to this entry through RSS 2.0. You can leave a response, or trackback from your own site.